BeneFIT Body is located on the corner of Ventura and Corbin. The studio is tucked away on the first floor of the courtyard in Corbin Village across the way from the Tomato Patch Cafe. The shopping center provides plenty of free parking. The studio is easily accessible from the 101 freeway and Ventura Blvd. Our clients come from Woodland Hills, Tarzana, Encino, West Hills, Calabasas, Canoga Park, Hidden Hills and Agoura Hills. The studio itself is clean and spacious, we have a bathroom for changing and cubbies for belongings. 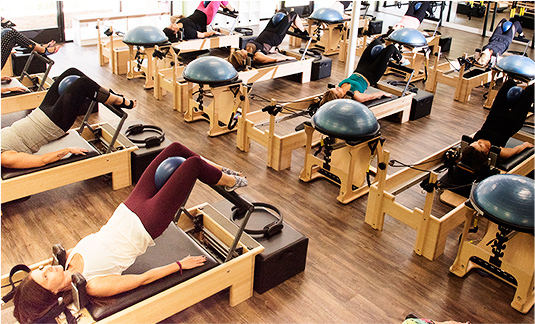 We are equipped with twelve brand new reformers, EXO chairs, TRXs, and Ballet Barres. We provide sweat towels and have a water dispenser. We require ALL clients to arrive on time and wear socks! On Site Parking/located downstairs in the Corbin Village courtyard behind the Pharmacy in Woodland Hills, CA. Short drive from Calabasas, Tarzana, Encino, Canoga Park and Hidden Hills.